One of the great things about paragliding is that there is always something new to try no matter what level you are at. Yesterday, Saturday the 5th, was a great day for trying new things. Nick was out there, working on his stalls and trying some helicopters. It is always good to see pilots trying new things, getting a bit of the acro bug. It would have been nice to have the time to go try a few things with you, since I have always found more motivation when more pilots are attempting new moves. Nick, did you get your SAT's dialed in? On the other extreme, we have Donna Therrien, who has been hanging around all of us PG pilots and never displayed an interest in giving it a try herself. But, there she is up on the hill with Ray, giving it a go. I hope it was worth the wait Donna. I on the other hand, decided on a new adventure, which was to give a launch that I had my eye on for a long time a try. For about a year, I have had my eye on that little ridge above Bobo's with the white cross on it. I haven't been getting out to Kahana as much, seeing as I can get my flying fix just about any day, closer to home at Makapuu. But, do miss the far more populated and social scene at Kahana. I had been trying to motivate the Kahana Marching Band to check it out, but they seem far too content at the usual launches. Yesterday, I finished a little work in Kahaluu in the a.m. and headed towards Kahana. The winds looked NE and moderate, and cloudbase was pretty high. My goal was to fly the Kaawa side of the bay without having to fly across Kahana Bay. Here is how it went. I called Jorge and Alex, they had other things going on, but Alex offered to fly across the bay to watch from above, which he did do. I parked at Swanzy Beach Park and walked up to the end of the road with Kaawa Fire Station on the corner. At the end of the road between the last two houses the trail starts. You go a few hundred yards into the narrow valley and you come to a crossing of trails. Turn left, with the orange ribbons to proceed up the backside of the ridge. The trail is steep and sometimes loose in spots, but took me about 20 minutes to reach the ridge crest. At the crest, you can now see over the front of the ridge and are standing next to an old WW2 bunker. Go around the back of the bunker about 50' more and look off to the left, the white cross is about 75' down the fern slope below you and you are literally standing on the launch. The launch is a nice tightly packed short fern and needs no work, please be careful on the delicate, and probably native, fern as I wouldn't want it to quickly become a bald spot, like at Kahana. There is a nice, but surprisingly light, NE wind blowing in. I study the conditions for a while, since there is a pretty substantial wall of to the right a ways and am not sure if it will have any effect on the airflow. There don't seem to be any immediate good bombouts below, other than Swanzy Beach Park, which is a little ways off. 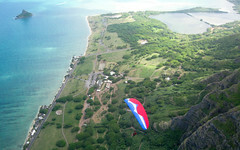 But then again Kahana has no immediate bombouts either, yet is a fine place to fly. I launch into a nice steady moderate cycle and slowly climb in smooth air, working from launch to the end of the ridge to the left. I was trying to avoid what I imagined would be some possible rotor from the wall on the right. As I climb and get more comfortable I venture deeper to the left to find that the best local lift is in that bowl, deeper than I would have imagined. At the back of Hidden Valley just behind launch is a 200' waterfall tucked into the back corner, really spectacular from down low. At about that time, I look over to see that Alex has made it across the bay. A little while later Jorge creeps over, really low and starts trying to work it. I had forgotten my radio and my T-Mobile cellphone had no reception on launch. As I made a few necessary calls, Alex climbed high and Jorge scratched hard low, but he ended up landing at Swanzy. Later on Jorge told me how he got really low and went to land at Swanzy, but was already too low to cross over the power lines. He charged back to the ridge, climbed a few feet and eked his way over the lines to land at Swanzy. I climbed up to try and join Alex, but he was already headed to Kualoa, I got some more altitude and headed over to join him. There was some really nice air at Kualoa, after playing there a while, we headed back over to Kahana, seeing as Jorge drove my van there. It was good to see everyone at the beach and to enjoy a really satisfying day. I was trying to think of a name for the new launch. There are the obvious like "Kaawa" or "Hidden Valley", "Super Cross", "Plain White Tee", "White Tee", maybe just shorten it to "Whitey's", but I think I will just call it "21" as Kaawa Fire Station is Station 21 and it marks the road to go up the valley to launch. You decide! You're the Fireman. YOU CREATED The new Launch. I think "21" is YOUR CALL & is GOOD for me! Excellent article, Dave! I can see you are the pioneer of the group. Keep it up! I never did get to try the SAT, by the time I felt I was ready, I couldn't get over 1100' over the water any more in the light lift. I wanted more. The heli's were fun, but boy can they go bad real fast. I'm happy I was on a docile 1-2 wing. I've done some studying and at least know the theory of stabilizing the spin. Next session I will SAT for sure! Nice article, you captured the mood of the day perfectly. Thanks for the great writeup, Dave. Sorry I didn't get any pictures of you over Kaaawa - I had camera trouble, intermittent error messages and horrendous lens smudges. At least I had my trusty old point and shoot for backup once we got to Kualoa. What a fun day. I'm not sure I'll be trying that launch anytime soon - but it's cool you proved it can work. 20 minute hike for Dave, what would what would that calculate for the rest of us......1 hour 20. Sounds great Dave hopefully others will want to try it and go easy on the ferns. Alex: you said,"I don't think I will be trying that launch soon". Isn't that the same thing you said about Lolo Launch ( now called Low Launch), North launch, Tomato Juice, Crazy Man, Manics and probably a few others? Make Troy proud. Ya Dave dont forget the scoldings others got for launching out of the MPU look out now named Para Park for it founder Alex.